LUNA Bar celebrated Equal Pay Day in a big way. The total bonuses for the 23 women will equal $718,750. "As you can imagine, this got us pretty fired up. We knew we had to do something. And do it now," the company said in a statement. "And let’s be clear, this isn’t about their bravery and determination — which they rock in abundance. Or even about the money. "It’s simply because, well, they deserve it. As do all women — whether they’re crushing it at work or playing soccer on a global stage. 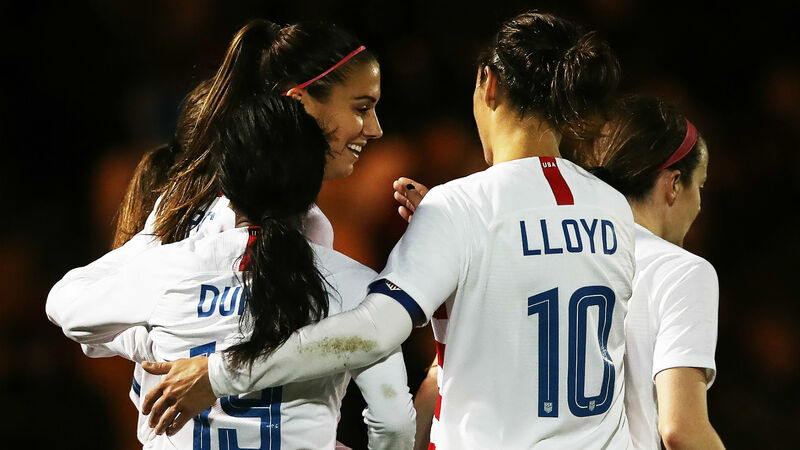 And by sharing their experience publicly, the players of the USWNT become advocates, mentors and role models to women and girls around the world." LUNA Bar gathered the women's team to share the news and drew cheers and applause. Megan Rapinoe, who has spent over a decade on the national team, was in shock, saying, "It's kinda wild." Adidas has also joined the WNT fight for equal pay and said athletes on the winning team of this year's women's tournament will receive a bonus equal to their male peers. There was no coincidence with the sportswear company's announcement either. It came the same day all 28 players on the USWNT filed a gender discrimination suit against the U.S. Soccer Federation citing inequities affecting everything from the team's pay, training and travel to medical treatment.